Uh-oh. On Wednesday Yahoo (YHOO) named Scott Thompson as its new CEO. Thompson is a former PayPal president and veteran technologist in the payment industry -- and that's the trouble. His background, like previous CEO hires, just isn't right for the struggling search giant. Thompson comes from the payments industry rather than an environment that requires engaging customers (and advertisers) through the use of enticing and attractive must-read content. 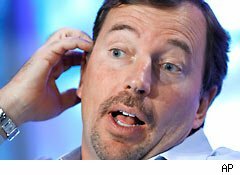 And given that Yahoo's source of revenue comes from display and search advertising, Thompson's lack of experience is likely to delay any turnaround efforts, especially during the period when he becomes familiar with the media and advertising industry. Yahoo shares fell on the news of Thompson's appointment, dipping as low as 3.37% during intraday trading to $15.74 a share. With archrival Google (GOOG) snaring the No. 1 spot for display advertising last year, Yahoo doesn't have the luxury of time to get its advertising and media efforts right. Net revenue generated from Yahoo's own websites has been in decline over the past several years, including the most recent quarter. Analysts expressed concern over Thompson's lack of media or turnaround skills during a Yahoo conference call to announce the appointment. Yahoo's chairman, Roy Bostock, however, responded that the key to advertising success is to provide a great customer experience, after which the ads will follow. He touted Thompson's online experience and success in listening to consumers' needs, increasing PayPal's user base to more than 104 million users from 50 million worldwide, and raising revenues in excess of $4 billion last year from $1.8 billion when he was appointed PayPal president in 2008. During the conference call, Thompson also cited his relevant experience at PayPal as having balanced customers' needs with merchants' needs, drawing a comparison with Yahoo readers and advertisers. When asked what Yahoo needs to jump-start its display advertising, Thompson said it is premature to say what changes he may make in that arena. Yahoo has virtually repeated the same mistake it made when it hired former CEO Carol Bartz, a revered technologist and executive. Bartz had done a stellar job turning around enterprise software maker Autodesk (ADSK) as CEO, but wasn't able to transfer those skills to the Internet media arena. Yahoo terminated her contract after two-and-a-half years, citing a lack of revenue growth despite her accomplishments in cost-cutting. Thompson does have a slight edge over Bartz in that he has Internet and consumer experience, but that's largely where the advantage stops. Motley Fool contributor Dawn Kawamoto does not own any shares in the companies listed. The Motley Fool owns shares of Yahoo, Google, and Autodesk. Motley Fool newsletter services have recommended buying shares of Yahoo and Google.